Liangbing Hu, an Associate Professor in the Department of Materials Science and Engineering at UMD, has recently won the 2017 Nano Letters Young Investigator Award. 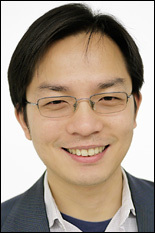 Dr. Hu, originally from China, completed his Ph.D. in Physics from UCLA in 2007. He joined UMD in 2011, and is currently a leading member of the University of Maryland Energy Research Center (UMERC). Dr. Hu has published more than 150 research papers in the field of nanomaterials and emerging devices. His research team "has made several important discoveries, including a structure with pure wood cellulose that achieved both high optical haze and optical transmittance, which is attractive for lighting and solar cells. This research developed into the fabrication of transparent wood and transparent paper... Hu’s group [has also] invented intercalation optoelectronics with the use of metal ion intercalation of 2D nanomaterials with an electrochemical method" (ACS axial). Nano Letters will present Dr. Hu with this award at the 254th American Chemical Society (ACS) National Meeting and Expo, taking place August 20-24, 2017, in Washington D.C.